Approved Driving Instructor (ADI) ? In order to train to become a driving instructor, you must first ensure that you meet the minimum requirements for entry to the Register of Driving Instructors. You must hold a Full UK or EEA car driving licence. You must have held your licence for a minimum of 4 years prior to your application for entry to the register. You must not have more than 6 penalty points on your licence (If you have more than this it is not an immediate decline. The Registrar will make a decision based on the circumstances). You must have not been disqualified from driving at any point in the last 4 years prior to your application to join the register. You must be a "Fit and Proper Person". All convictions, motoring and non motoring, will be taken into account by the DSA before a decision is made as to whether you may be added to the register. A CRB (Criminal Records Bereau) check will be required as part of the application process. The cost of this is currently free. You will need to make an application to the Registrar, this can be done online. If you are accepted you will be given your unique number and then you can go on to start the qualification process, starting by attempting to pass your Part 1 Theory Test. As you progress and pass each stage of the qualification process, you will need help along the way, at Catz Eyez we are able to help you by offering packages to suit you for Part 1, 2 and 3. You must pass all 3 separate exams with the DVSA to become a fully qualified Driving Instructor. There are time limits and conditions for each examination which will be explained in detail below. Only when you have completed all the training and qualifying exams will you be entitled to use the term Approved Driving Instructor (Car) after your name and you are then allowed to charge people for teaching them to drive. It is against the law for anyone other than a fully qualified ADI o charge for driving lessons. You may take an unlimited number of Part 1 attempts until you pass. Once you have passed you may then proceed to the next part of the qualification process, Part 2. Part 1 is just like a learner driver test, however you will be required to answer 100 multiple choice questions questions. You must achieve a minimum of 85 correct answers AND answer at least 20 questions correctly from each of the 4 categories of questions. You will also have to carry out a Hazard Perception test where you will be shown 14 video clips and you must identify the developing hazards. You will be scored on how quickly you see developing hazards and you must achieve at least 57 points out of a total of 75. You must pass both the multiple choice and hazard perception test on the same day. If you fail either of the tests you will not pass Part 1 and will have to retake the entire examination. If you pass Part 1 you will be given a pass certificate which will be valid for 2 years from the date you passed. If you allow your Part 1 to expire before you have completed all of the qualifying exams, you will have to start the entire training process again. In total you are allowed to make 3 attempts at passing Part 2. If you fail to pass on the 3rd attempt you will not be allowed to proceed with the rest of the process and your name will be removed from the register. You will then have to wait 2 years before applying to the registrar again and starting the qualification process from the start. The Part 2 exam is conducted by a Senior DSA Driving Examiner. Before taking the test the examiner will test your eyesight. You must ensure you are able to read a number plate at a distance of 26.5 metres. If you need to wear glasses or contact lenses to correct you sight you must ensure that you have these with for the test and they must be worn at all times. If you fail the eyesight test you will not be allowed to proceed with the driving test and your licence may be revoked. Once you have passed the eyesight test the examiner will then ask you 5 show me tell me questions about the vehicle you are driving, before moving on to the rest of the driving test. You will be expected to drive in a brisk business getting from A to B ensuring that the journey is at all times safe and within the law. During the examination the examiner will ask you to demonstrate 5 set manoeuvres and demonstrate an emergency stop. You will be examined driving in a variety of environments including motorways/dual carriageways, rural locations and in and around town. In total you are allowed to commit 6 minor driving faults, with no serious or dangerous faults. If you commit more than 6 minor faults and/or commit a serious/dangerous fault, you will not pass this part of the qualification process. It is very important that you do not under-estimate the Part 2 test. It is unlikely that you will pass this test unless you receive professional training. The standard required to pass this test is very high and many people embarking on Part 2 without training will fail. This could jeopardise your entire training process if you continually fail. Once you have passed Part 2 you may then proceed to the next part of the qualification process, Part 3 OR you can apply to the DVSA for a Trainee Licence (Conditions Apply). The Trainee Licence option will be discussed in more detail with you by your trainer. You are allowed 3 attempts at Part 3. If you fail to pass after the 3rd attempt you will be removed from the register and will not be allowed to proceed to full registration. If you are on a trainee licence at this point this will be immediately revoked and you will no longer be allowed to charge for teaching. You would then have to wait a period of 2 years before starting the entire process again. The Part 3 test is again conducted by a Senior DVSA Driving Examiner who will play the role of a pupil. The test is split into 2 half hour tests called Phase 1 and Phase 2. Phase 1 (Teaching) consists of a half hour driving lesson whereby the examiner will play the role of a pupil and you will be required to teach him/her a subject e.g. moving away and stopping, emergency stop. Phase 2 (Fault Finding and Correcting) is the second part of the exam and is conducted immediately after Phase 1. The examiner will play the part of a Trained Pupil and you again the examiner will give you a subject to follow. In Phase 2 you will be expected to identify faults committed by the pupil and correct these where necessary to ensure that the fault does not recur. You instructional style and the way you communicate will also be examined and at the end of Phase 2 the examiner will grade each Phase. In order to pass Part 3 you must pass both Phase 1 & Phase 2 on the same day. 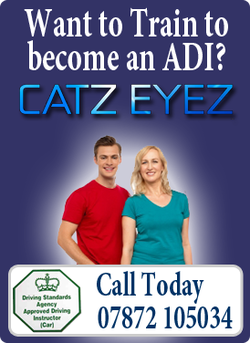 If you would like more information on how you too could train to become an ADI ( Approved Driving Instructor) Catz Eyez Driving School has a range of courses to suit your needs.